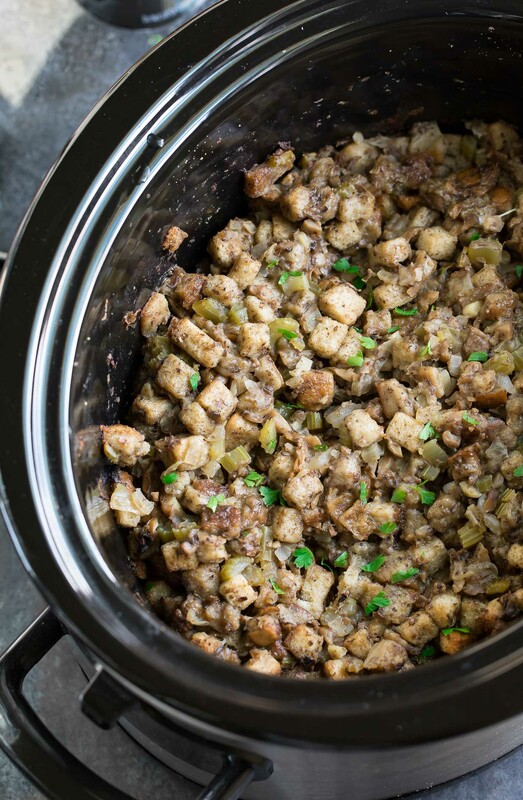 Save precious oven space with this classic Slow Cooker Stuffing recipe! Since converting my mom’s Thanksgiving stuffing to the crock-pot I’ve been OBSESSED with the results. It comes out perfectly tender on the inside and crisp on the outside! I’m so excited to be able to say that the best stuffing of my LIFE came straight out of the slow cooker and there is no turning back! 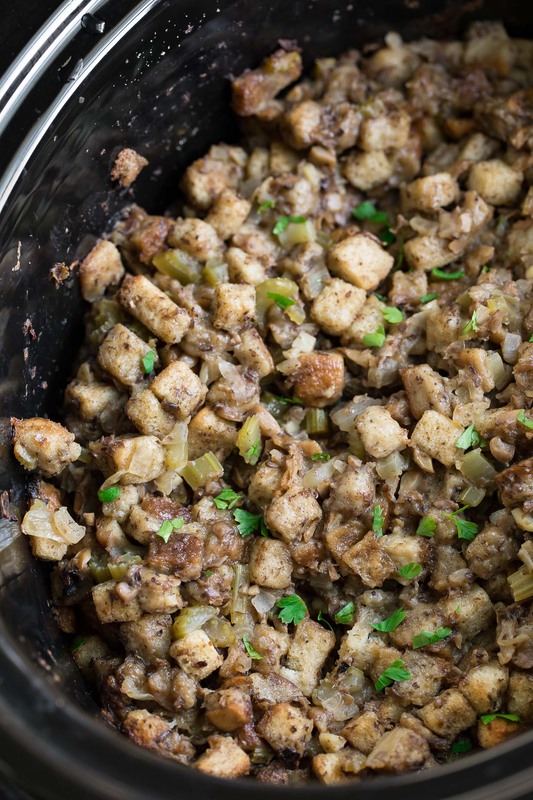 We’ve been making my mom’s traditional stuffing recipe for ages now. We used to simply stuff in the bird and call it a day until I took a food safety course and was basically schooled on how risky that practice was! Myyyyy bad! Naturally we just moved the stuffing to a casserole dish and plopped it in the oven, but the problem was that it took up major Thanksgiving Day real estate that we couldn’t afford to give up. 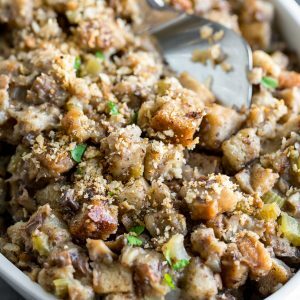 The solution was kind of life changing, because moving our go-to stuffing recipe to the slow cooker was quite possibly the best thing to ever happen to it! The stuffing came out super moist and almost bread-pudding-esque in the center (softened and moist but not runny) and crispy on the outside — aka my idea of stuffing perfection! Since we have two slow cookers tucked away for such occasions, I’m now able to pop my stuffing in one and my mashed cauliflower potatoes in the other and basically rock the holidays. We also do our cranberry sauce in the crock-pot the night before. For this particular recipe, I have the ultimate make-ahead hack! Snag the recipe above and complete steps 1 through 4. Remove from heat and allow veggies to cool. Place in an airtight container in your fridge. When you’re ready to make your stuffing the next day simply add it to the slow cooker with the remaining ingredients and set it to low. SO EASY! I started doing this last year and it made me so happy to have basically the easiest dump-and-go stuffing on the planet. It was just as delicious as fresh-made and made cooking on Thanksgiving so much easier. Keep reading after the recipe for some of my favorite prep-ahead tips to make Thanksgiving eats easy! 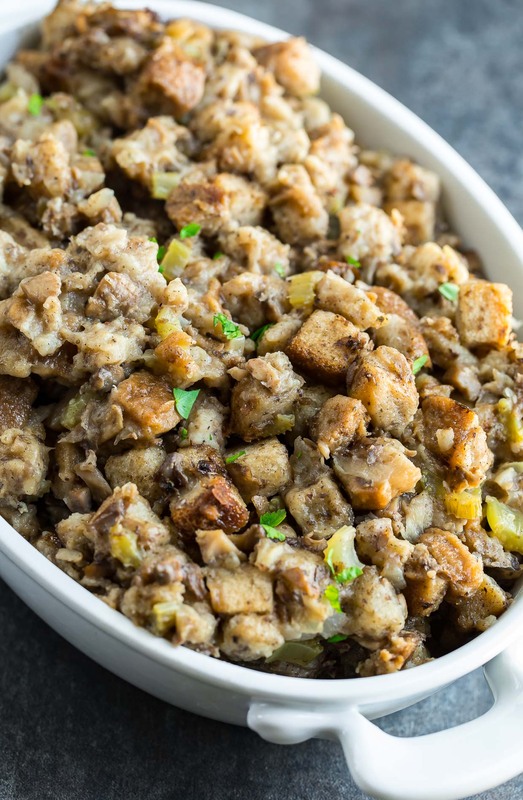 Save precious oven space with this classic Slow Cooker Stuffing recipe! Since converting my mom's Thanksgiving stuffing to the crock-pot I've been OBSESSED with the results. It comes out perfectly tender on the inside and crisp on the outside! Large dutch oven, pot, or high-sided skillet. Heat a large high-sided skillet or a dutch oven with 3 TBSP butter on medium-high heat until frothy. Add onion + celery and sauté, stirring occasionally, until onions are brown around the edges and veggies begin to tenderize. Next add minced garlic and mushroom and cook until veggies have softened to your liking. Lightly butter the sides and bottom of your slow cooker and add your veggie mixture. Top with dry stuffing mix and a whisked egg. Mix well and secure the lid. Cook via slow cooker on the LOW setting for 2.5-3 hours. May be cooked a bit longer if desired or switched to the warm function while you await dinner! Feel free to top with an optional sprinkling of parsley and/or crushed breadcrumbs for an edible (+ pretty!) garnish. For an extra soft stuffing feel free to drizzle some extra broth, gravy, or butter on the stuffing while hot. 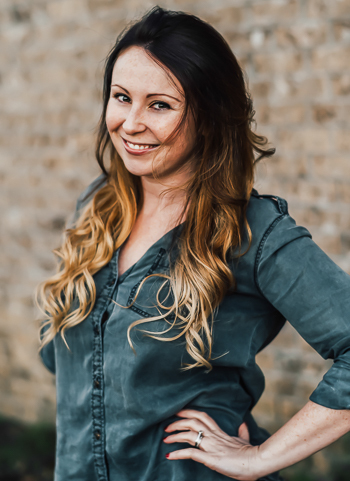 Keep reading after the recipe for some of my favorite tips to make cooking all your tasty Thanksgiving recipes SO easy! * Chicken broth may be used in place of veggie broth, if desired. I’m a big fan of pulling all our family recipes ahead of time and printing anything new out that we plan on trying so there’s no confusion or time wasted scouring the house/internet for the missing recipe. Same goes for your vegetables! The day before I chop things like brussels sprouts, celery, onion, green beans, etc… and portion them out in the fridge in baggies and label the amount with a sharpie so I know where they go the next day. It’s a total lifesaver! MAKE SIDES THE DAY BEFORE! Things like hot corn and cranberry sauce can easily be made the day before and reheated on the stovetop or in the microwave. looking for a few more holiday sides? Spicy Southern Hot Corn — my husband’s FAVORITE! Stuffed Mushroom Casserole – holy cow I love this stuff! Honey Roasted Butternut Squash with Cranberries and Feta – READER FAVORITE! And how do you eat this, with side dishes? Or only as main dish? Thank you Elviera! We eat this as a side dish but it could totally be a vegetarian main course too with all the typical thanksgiving/holiday sides along with it! YUM! 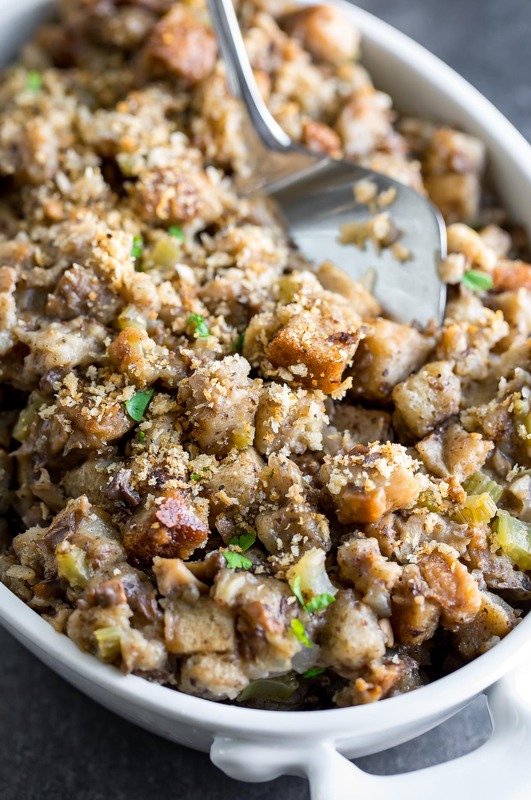 Is it weird that I could just attack this slow cooker stuffing with a fork and call it dinner? SO hungry for Thanksgiving dinner, now! LOL Erica I have done this before and plan on doing it again next time we make it! SO GOOD! I love the fact that this is made in the slow cooker! Such a time saver! It’s so crazy easy like this! For sure a time/oven saver!